This is a long post. There are some photos and illustrations below, so if you bear with me, it will become more visually interesting as we go along. In the last post, I talked about a painful condition I have on the outside of my left foot that first showed up after I ran the Disney Family Fiesta 5K back in January. Before we could decide that it was a peroneal tendon strain, we had to rule out Jones Fracture, so I got an X-ray and was really happy that it wasn't a Jones Fracture. The best way to heal a peroneal tendon strain, I gather, is to just stop running for a couple of weeks, ice it, ibuprofen it, do some stretching exercises, rehabilitate it, then re-enter the activity -- kind of standard. I'm going to add some osteopathic manipulation and some percutaneous electronic nerve stimulation to the mix. But the point with someone engaged in an athletic activity is that when they are injured they often don't want to give up the activity. I don't want to give up running. Why should the rest of my body have to be deprived of the enjoyment of running and working out just because a tiny part of my body -- those teeny tendons -- are complaining? Well, of course there are other things I can do to cross-train. It doesn't have to be all or nothing. However, one reason I chose running is that I like it way better than those other activities. They say to find something you like and then you'll do it. They say that if you are doing an activity you find boring it will be harder to stick with it. So, I passed by all those other activities for running and Kung Fu and I want to keep doing what I enjoy. However, the argument could be made that 2 or 3 weeks is really nothing at all and it passes by quickly. And besides that, I didn't run for 6 weeks because I fell out of the habit -- which is part of why I am in this boat to begin with -- so if I went 6 weeks without running back then, why oh why would 2-3 weeks be a problem now? And yet, stubbornly, I don't want to take that time off. Stubborn and dumb. I don't want to have to "begin again" again. As much as I enjoy all stages of running, and could find much to enjoy in the early stages of just getting back out there, I don't want to have to start from scratch again. So, I am going to do what so many other runners do and see if I can "beat the injury clock." I am going to try to run enough so that I don't make the injury worse, and take enough recovery time between runs to allow the injury to heal. It's a kind of compromise. It might take longer for it to heal this way,, but as long as the healing sessions are outpacing the re-aggravation/re-activation sessions, it should work. At least in theory. So, now I know what the injury is, and I have a plan to heal and repair it. The other component is finding out what caused it so I can prevent it from happening again, and also so I can prevent myself from undoing the healing. For example, if there is something wrong with my form and I just keep re-injuring it over and over again, then the healing is pointless. One can get into an injure/heal kind of cycle that doesn't make sense. I get the feeling that once one gets into that kind of cycle, the injury eventually wins out. So, I need to know the cause -- the mechanism of injury, as my DH calls it -- so I can prevent it from happening again. It could be one of these things, more than one of these things, or all of these things acting in concert that set up the conditions for the injury. It could just be as simple as I didn't train for 6 weeks, gained weight, and went out and tried to run a 5K distance. That is "Too Much Too Soon." To pin the problem solely on the weight gain wouldn't be exactly right because that weight gain could have been accommodated with the right kind of training, very gradually strengthening the feet, muscles, tendons, etc... to accommodate the extra weight. Seems to me that all TMTS injuries involve a problem with the body bearing it's own weight, whether the person weighs 150 or 250. It's the "too soon" part that can vary depending on how much weight is being borne. So, although the extra pounds were a contributing factor, it was TMTS that played the most significant part in this injury, but is that enough to know to prevent further injury, or could there be more involved? If it was merely extra weight and TMTS, why was only one body part affected and not many others? There has to be a reason that particular foot and those particular tendons bore the brunt of things. While I don't think that I usually invert my foot when I barefoot run, it is possible that I did that day. Here are some of the possible causes of my inverting the foot (if I did). Perhaps my ankles were weaker after six weeks of not running and they did not support enough and the foot rolled to the side because of that? I may default to the side of my foot to avoid digging in at the second metatarsal, which is a "Morton's toe" kind of situation. I have written about this longer second metatarsal bone in my left foot in the past -- (See blog post "Aha! I found it! Why the second metatarsal is bothering me") -- and about how I experience discomfort at the point where that joint makes contact with the ground. 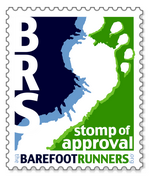 Since the time I wrote about it, I have found that there is a group in the forums at the Barefoot Runner's Society where they discuss this particular issue (will add a link later because barefootrunners.org doesn't seem to be loading right now). It is possible that in order to avoid the little spot that is uncomfortable, I am compensating by inverting the foot and putting more weight on the outside of the foot. This brings me to a side note: When a person has a lot of extra weight to carry along, there is less margin of error for imperfect running form. That is, you're not going to get away with poor form for very long. Landing on the side of an inverted foot is going to hurt with all that extra weight. A lighter weight person is going to get hurt eventually too, especially if they are racking up the miles, but it might take way more repetitive landings to bring about that awareness. In this way, being overweight can be an advantage because the overweight person is made aware almost right off the bat when something is wrong. I have checked my barefoot form, and everything seems to be pretty good with that. I have noticed that towards the end of the run, when I am getting a little tired, there may be a tendency to put more weight on that left side of the foot. As much as I would love to run barefoot all the time, this year I decided to invest in a pair of minimalist shoes, thinking that there will be some times that I need to put on shoes. (I had hoped that the Vibram 5-finger KSOs that I owned would suffice for this purpose, but I found out last year that I did not like them for bitter cold weather running, which is one of the major times I would consider putting on shoes.) After reading a lot of reviews and reflecting a long time, I had finally decided on the Merrell Pace Gloves. One of the main reasons is because the Merrell company was at the 2nd Annual NYC Barefoot Run and I had a chance to try on a pair and was very impressed. Up until the time I went down to the Disney race, I had not run or trained in the Merrell's at all. As I was packing to go down to the race, I remembered the really sharp, pointy parking lot from last year's race, so I threw the Merrell's into my carry-on bag. As I pondered, on the eve of the Disney Family Fiesta 5K, whether I should be attempting to run the 5K, there was no question about whether I should be doing that first mile barefoot or not. Perhaps if I had kept up my training, and specifically had trained to run on the sharp pointy stuff, I could have made the decision to run it barefoot again. However, I knew for sure that coming from six weeks of not running would NOT be the time to run on the sharp pointy stuff. So, I put on my Merrell's for the first mile of the race. It didn't seem dumb at the time. It seemed smart to cover my feet for that painful parking lot. However, there was a dumb element in that I had not used the shoes, had not acquired any running experience with them, and had no idea how they would work for me. During the race everything seemed fine, and it got me past the pointy part and to the place where I could take off my shoes and finish the race. However, now that I know about this foot inversion thing, I thought I'd take a look at the way the shoes were designed. Come to think of it, I did remember the sensation of my foot rolling to the outside a little bit during the part of the race that I had run with the shoes on. I put the shoes on and ran in the backyard a little bit with them. They felt pretty great, as great as I remember them feeling, but I did notice a feeling like I was balanced on a thin base that did not feel 100% solid beneath my feet.. I took a look at the sole. See how thin the base of the shoe is? I feel slightly unstable on that thin a platform. The foot feels like it could rock a little bit. It's kind of subtle, but it's there. There is also a little bit of arch support in this shoe. It's not so much as a blatant arch, but that the shoe is designed to the shape of the arch of the foot. I guess that is why the shoe feels like a fitted glove. This fitted feeling is something that caused me to favor these shoes and I really love it, actually. But it is possible -- I thought, as I ran in the shoes -- that the presence of this arch is obstructing my arch's natural motion enough to push my foot to the outer edge. There might not be quite enough give in the shoe's arch, so that my own arch's springiness coming up against it is causing the foot to rebound back to the outside of the foot. Or, it could be because the toes are pointed up. Most shoe companies have this feature, I've noticed. Most of the minimalist shoes have the toes pointing up. I feel that this makes a difference. I can't quite explain how or why, but seems like there could be some kind of top-of-foot strain with the toes up like that and unable to make contact with the ground. And in the photo, it even looks like my foot is tilting to the outside. As much as I love the Merrell Pace Glove and appreciate what they have attempted to achieve here, it is clear that my heel is not achieving the same position on the ground that it can and does when it is barefoot. I don't want to blame the shoes for my injury. There is no way of proving that they caused me to invert my foot during the race. However, the possibility is definitely there. It could have been happening due to the design of the shoe, and my not having practiced with them, and my running in a race without training for it. Oddly enough, as I was visiting all the runner message forums seeking out information on peroneal tendinitis, I found a few curious comments in some of the forums about peroneal tendinitis being sometimes called "The UGGs Injury." Could it be a coincidence that this is the year I decided to purchase my first pair of UGG boots? In fact, I purchased them on the same day that I acquired my Merrell Pace Gloves. It was kind of an impulse purchase, but I needed something to slip my bare feet into when I ran outside in the cold to put the garbage out, or to drive to the store. I had been thinking that this UGGs concept might work for that, and had been reading up on it. The fact that podiatrists did not like the UGG boots because of the lack of arch support actually inclined me towards them. I have actually been loving the UGG boots. All these years I have resisted them, also thinking that they were not very attractive, but finally I knew why women loved them. They seemed so plush, so warm, so comfortable. And now I had the added benefit of being able to just slip bare feet into them. They almost seemed perfect for a person who preferred to go barefoot most of the time. Apparently there can be problems. 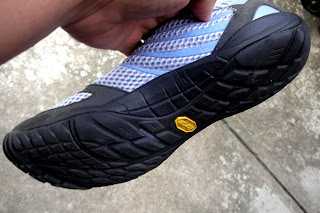 On a blog post I found, Joshua Tucker,"The Tendonitis Expert" explains (in the comments section below his post about experimenting with Vibram shoes) how the platform of a shoe causes our foot to act differently than it does on the ground when we are barefoot. His explanation made sense to me based on my experience of walking on the platform of the UGG boot. While barefoot, the foot "folds/ bends/grips around objects." The toes work independently of each other, the muscles of the leg get fired up by this. All of the things going on while we're barefoot help support the arch. However, while walking on a stiff platform inside a shoe, your foot rests on this hard platform and the platform does not bend around objects on the ground. Even though Mr. Tucker says later in the comments that he likes his own pair of UGG boots, my experience of the UGG boots are that they have that hard stiff platform, and my feet are not acting naturally, like they would when I am barefoot, while they are in the UGG boots. And it just so happens that I had my UGG boots on the night before the race. I had worn them to the airport and had to really hustle and walk distances in them. I was a bit upset to find out that I had chosen the wrong shoes to use for traveling. I had thought it would be a good thing to use them, but had never really walked so much in them before and was discovering that they are not the ideal choice for this kind of walking. When we finally got to the Disney hotel, I was glad to sit back, kick off the UGGs and just wait for our suitcases to arrive from Disney's Magical Express. The suitcases usually arrive a couple of hours after we do, and my other shoes were packed in those bags, except the Merrell's that I was going to need for the race the next day. However, an unforeseen food emergency necessitated that I hustle over to the dining hall -- which was a considerable distance from our room -- and back before it closed. I thought for a second about putting on the Merrell's for this purpose, but decided it was easier to just throw on the UGGs. That was a mistake. I was uncomfortable using them for this task the whole way and back, and by the time I got back I was even a little worried because the soles of my feet felt sore and raw. "Oh no," I thought, "Is this going to affect my race tomorrow?" Well considering what I have been reading about UGG boots, and also considering what "The Tendonitis Expert" said about walking on stiff platforms inside of shoes, and also considering how at present, I feel my injury now and its pain much more while I'm wearing UGGs than when I'm walking around barefoot, I would seriously consider the possibility that the injury was either caused by the way I walk in UGGs, or that my use of the UGGs predisposed my foot to get the injury when I ran the next day. I can't believe anyone is still reading, but if you are, thanks for helping me go through all my possibilities. Great read ... Thanks for lll the detail. I have never heard of this condition but seem to have the samr issue. Have been trying to run thru it and correct my posture as I go but alas it isn't getting better. Taking time off to recover isn't an option. Thanks again for the info. I'm in the exact same boat as you. the podiatrist said "stop running and get rid of your danskos" and I'm thinking the Uggs have to go too. Thanks for the information! I've been battling Achilles tendinitis for awhile. It seems to have cleared up for the most part, but I'm starting to think that I also have peroneal tendinitis. Hi, interesting read. I also resisted uggs for yrs and decided I wanted warm feet this winter and got a pair for this xmas. Worn them once for a big walk whilst pushing a pram and got reply sore feet. Within 3 days of having them I developed tendonitis so bad I couldn't put any weight on my foot!!. It has to be the uggs,.never had this before in my life, very painful...uggs returned to shop! I am dealing with peroneal tendonitis after buying trainers thats were fitted correctly for my gait with insoles moulded specifically for me. I KNOW why I have this problem but dont like the fact that I am an adrenaline junkie who always begins running tentatively and by 5k thinks I can outrun the traffic if I up my pace therefore causing my feet to slam at odd angles and straining my ankle, then getting frustrated at having to wait 2- 6 weeks for each injury to heal.So the cycle begins again, until now after 6 months of on off running I finally get it.Slow down, warm up and take my time...respect my legs!